Celebrate the last few drops of Summer with grilled pizza! It’s one of my favorite ways to make pizza! 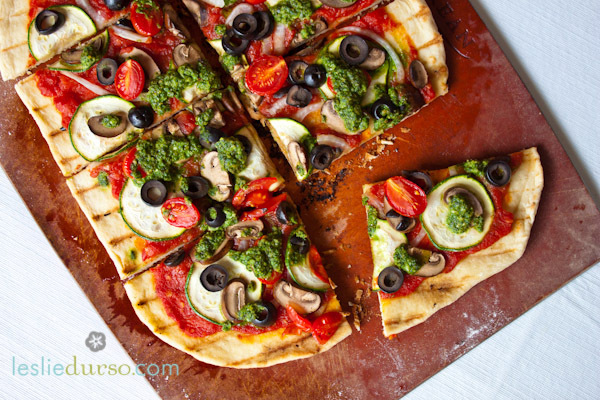 You combine 2 of my favorite things, all that fabulous smoky flavor from the grill and pizza (of course!). Pizza is a long standing tradition in my Italian family. My Great Grandma used to make it, my Dad makes it, and I make it. I hope you enjoy this pizza as much as I do! Cover the dough with a light coating of olive oil and place in a bowl covered by a clean towel. Let rise about an hour or until dough doubles in size. Place all ingredients in a food processor and pulse. While pulsing, drizzle in the olive oil until smooth. Halve the pizza dough and with your hands form a round circle. Place dough directly on a warm bbq. As soon as it starts to bubble, flip over. Quickly spoon desired amount of tomato sauce on the dough and spread out evenly. Add toppings and pesto. Close the lid of the bbq and let cook until veggies are soft and dough is cooked. Enjoy immediately! Uauuu nice pizza Leslie :)Love it! I made this last night and it was delicious! I had a hard time getting the dough to roll out nice and evenly like yours, but the whole family really enjoyed the finish product. I love your website! I’ve just made this without realising our BBQ is out of service! Can I bake the dough instead? Help!!! I have it all ready but how do I cook it? Yes, you could easily just bake it like a normal pizza 🙂 or you can fry the dough in a frying pan on high heat with some olive oil!